Pulitzer Prize-winning playwright Beth Henley has written a hard-hitting story of two women, each a pioneer in her own way, on the High Plains of Wyoming in the 1860s. JoBeth Williams and Amy Madigan create Macon and Bess, two mail order brides who become friends while each endures a life she did not necessarily want. The story covers 25 years of their tragic adventures and painful mishaps. JoBeth Williams makes Macon a thoroughly fascinating character while Amy Madigan gives Bess a complexity that make you want to love and pity, then hate and pity her. 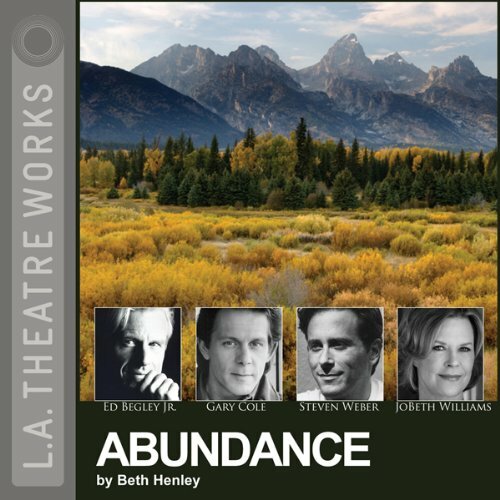 Gary Cole, Steven Weber, and Ed Begley, Jr., are the men in their lives, and each one is cleanly realized with vocal characterizations that in some cases make your skin crawl. This is a plainly produced but satisfying audio performance. From the Pulitzer Prize winning author of Crimes of the Heart comes this poignant but unromanticized story of the hard lives of pioneers on the high plains of Wyoming in the 1860s. Macon and Bess are two mail-order brides, lured to the West by the promise of new beginnings through marriage to men they've never met. While waiting for their respective husbands-to-be, one bubbling with optimism, the other mousy and plain, the two women become instant best friends. As Abundance follows the two women through their friendship and adventures for the next 25 years, this Western epic unearths the dark underside of American mythology. What could Beth Henley have done to make this a more enjoyable book for you? The characters were a bit shallow. The author failed to make the bond between the women as strong as she needed for the story line. I wanted to have some admiration for them but they appeared more foolish to me. I only listened to this story all the way through because I really enjoyed listening to the reader. She gave me hope, although in the end, it was dashed by the author. While I like the speech/delivery of those who narrated this story, the plot left much to be desired. Not worth the time to listen to the book.